Home Blog Hint: Why is my wacom pen pressure sensitivity not working? After starting Adobe Photoshop suddenly the pen pressure of your wacom tablet is gone! This can happen after a new program update for example. You are missing your wacom pen pressure? The interesting thing is: The pen pressure is not really removed. Other tools that supports Wacom tablets works without any issues. So what is the reason for this strange problem? But sometimes even creating the PSUserConfig.txt file does not help. A possible reason for the missing pressure can be to restart the wacom drivers. You can restart your pc to do solve this. But a reboot can be uncomfortable when you have opened already some applications and don’t want to start them all anew after the system reboot. Wacom delivers a small but nice tool to backup and reload your settings and drivers. 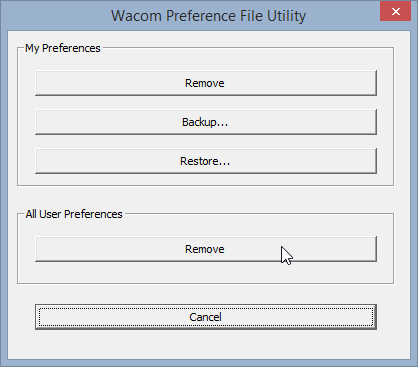 It is called “Wacom Tablet Preference File Utility”. Go to Start > All Programs > Wacom Tablet > Wacom Tablet Preference File Utility. Use the shortcut Windows+Q and type in “Wacom Tablet Preference File Utility”. It should appear automatically. Go to Start > All Programs > Pen Tablet > Pen Tablet Preference File Utility. Before you can do this you should stored your preferences once before by using “Backup…“. Blog, English, Hints, Photoshop, Tips. Lesezeichen.